When the Thirteen bus pulls up one dreary, stormy evening, something about it doesn’t seem quite right. The driver grins down with a mouthful of long, white teeth, and there’s barely any room to sit. But Michael McMichael is bringing his gran something very dear, so he gets on board despite his misgivings. As they travel on and the rest of the passengers get off, Michael realizes there’s nothing normal about this bus — and the driver is getting creepier by the minute. Best-selling author Bonny Becker’s cleverly rhyming text in THE FRIGHTFUL RIDE OF MICHAEL MCMICHAEL will chill and thrill readers alongside Mark Fearing’s wonderfully funny illustrations, making this book perfect for Halloween story times — and lovers of things that go bump in the night. First, I have to say I love the dedication by the illustrator. I’m not sure who Lily is, but his dedication is to her. It says something to the effect that if there weren’t scary books, Lily wouldn’t have learned to read. You know, this says so much! Kids are not going to read books they don’t like. Thankfully there are authors like Bonny Becker who understand that kids like all sorts of different types of books! 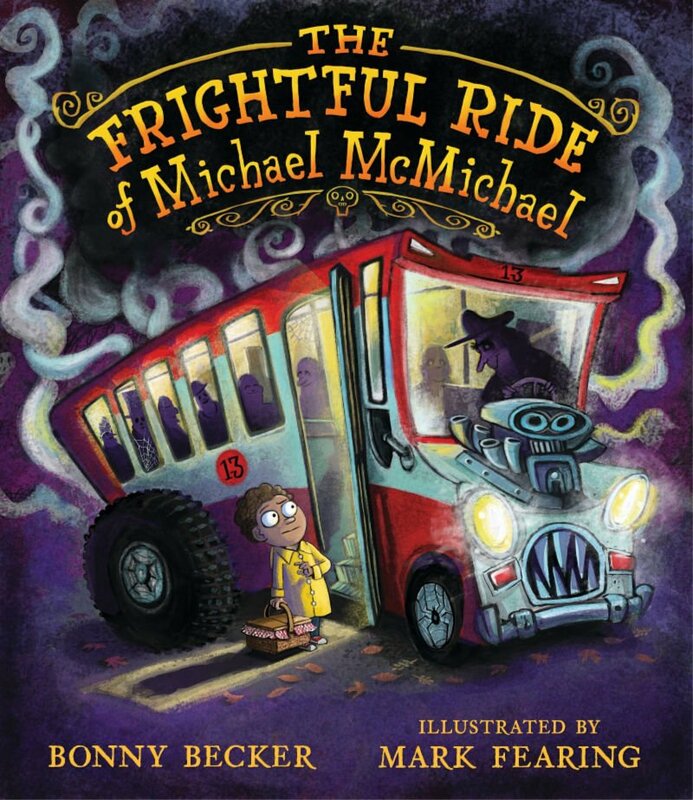 THE FRIGHTFUL RIDE OF MICHAEL MCMICHAEL is great for kids who like a little bit of creepy and spooky in their books. I absolutely loved it! The title is so clever, and the cover reminded me of The Knight Bus from Harry Potter. I’m a huge Harry Potter fan, so, of course, this made me want to read The Frightful Ride of Michael McMichael even more! The illustrations truly bring the characters and the bus to life. It’s all the little details in both the text and illustrations that make THE FRIGHTFUL RIDE OF MICHAEL MCMICHAEL a fun and exciting ride! Bonny Becker is the author of the best-selling Bear and Mouse series. These include A Visitor for Bear, A Birthday for Bear, A Library Book for Bear, and others. The Bear and Mouse series is illustrated by Kady MacDonald Denton. Bonny Becker lives in Seattle, Washington. Mark Fearing is the author-illustrator of The Great Thanksgiving Escape and Giant Pants, and he is the illustrator of several other books for children. He lives in Oregon.